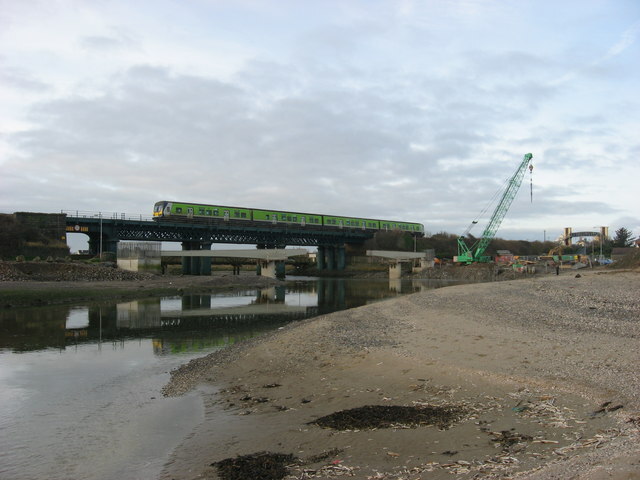 New footbridge under construction across the River Nanny to replace a wooden footbridge just visible on far side of the railway viaduct. The opening sequence of Neil Jordan's film 'The Crying Game' was filmed from the wooden bridge looking towards the carnival which was set up just to the right of photograph. The railway viaduct was built 1896-97 by the Cleveland Bridge and Engineering Company, replacing earlier bridges of 1859 and 1844. This page has been viewed about 309 times.